The USD last saw prices this low in 2015. 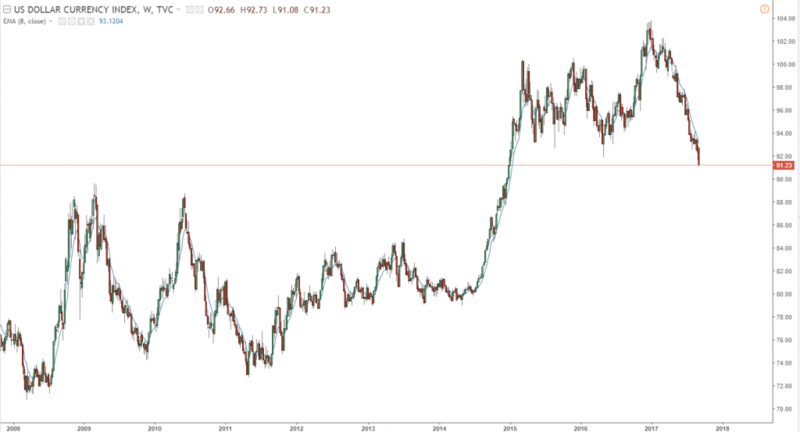 The dollar has seen nothing but red this year, is it time to buy the US dollar? The Year of the Bulls Turned Sour. Every man and their dog was long the dollar going into 2017. The story was clear: we had a weak Euro-zone, weak Canada, weak Japan, and a strong USA with a clear path of interest rate rises. Turns out that everyone was wrong. If we are thinking about going long dollar, it makes sense to look at the main component of the DXY first…the Euro. The Euro has rallied this year on the back of strong Eurozone data and rising inflation expectations. This led to strong shift in sentiment, as traders re-positioned, dumping shorts and getting long, creating a huge surge in demand. Try as he may, Draghi just cannot jawbone it down. We have seen traders already pricing in the end of QE, and have most likely started to think about rate rises too. Considering this, the Euro seems to be at a fair value vs the USD at 1.20. Things can change though, quickly, as we saw this week with the Bank of Canada surprising the market with another rate rise . What the BOC is telling the market with this rise, as Brandon Turner pointed out, is that this rise is an admission that they’re behind the curve on rates, and will likely continue with this aggressive trajectory. Should the ECB move with comparable aggression, I’d say the Euro has some more room to move. So, getting back to the point, is it time to get long the USD? Perhaps…if you like a gamble. The sentiment is still very negative, and price has just broken a long term support level around the 92 area. I will be looking for the long on sign of exhaustion or support down at 87. There’s also the Trump proposal of mandatory repatriation of foreign corporate profits. Should that happen, we will see a strong rally in the USD. It could be a while off, but keep an eye on that play.